These are items I have looked into or am looking into now: researching. Some of them, I have purchased or been given, etc... Some of them I have borrowed from the library. Some of them I would like to say more about so please stay tuned! 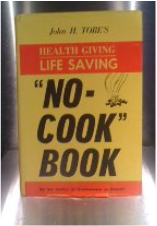 Health Giving Life Saving "No-Cook" Book by John H. Tobe; 1969 -- This one, I found in the free pile in the vestibule at the library. The inside flap jacket copy begins, "What a mad scheme to write such a book! The work of either a visionary or a mad man." The book is about not cooking your food and has many instructions about that. I wonder if a raw food diet is a plausible option for the non-cook; I hope I am not totally missing the point. This is what the book looks like. Very fanatical. Mud Pies and Other Recipes by Marjorie Winslow illustrations by Erik Blegvad;1961-- A pretend cookbook! Dirty Sugar Cookies: Culinary Observations, Questionable Taste by Ayun Halliday; 2006-- Of picky grouchy interest because Halliday talks about being a terribly picky eater as a child. Man With A Pan: Culinary Adventures of Fathers Who cook for Their Families edited by John Donohue; 2011--This one I actually bought as a father's day gift for my beloved husband, but have read avidly, except for all the recipes, which I have skipped; although this is not stressed, in the book, I believe that behind many a man with a pan, there's a lady or partner who's a non-cook. The Gastronomy of Marriage: A Memoir of Food and Love by Michelle Maisto; 2009-- Not promising from the grouchy perspective, but we'll see. Gluttony by Francine Prose; 2003-- Possibly promising from the picky perspective?